This method is not hard, once you get the hang of it, and thanks to the extra-high heat of the grill, it makes some of the best pizza you'll ever eat! [post_ads]We have talked about grilled pizza quite a bit here at The Kitchn, but what if you've never actually tried this method? Well, we have just what you need. Here is a step-by-step tutorial on grilling pizza. Honestly, this method is not hard, once you get the hang of it, and thanks to the extra-high heat of the grill, it makes some of the best pizza you'll ever eat! 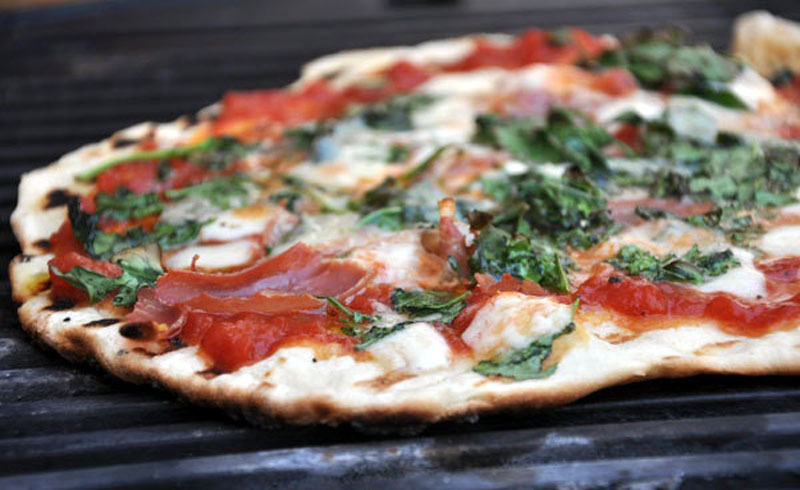 Grilling pizza isn't just an alternate method for when you don't want to heat up your oven (although that is a side benefit). The best pizza is made in the hottest oven possible, and since your grill can get so much hotter than your oven, for most people it is the best instrument for making terrific pizza. Your kitchen isn't heated up by the oven, and a blazingly hot grill means a crisper bite and those deliciously charred spots on the bottom of the crust. Not too charred, of course, but hopefully just enough for your taste! I actually used to be very intimidated by grilling pizza. I had a couple of bad experiences (charred crust! Flaming pizza sauce!) but then I got my method straight. It's not hard, but you do need to be organized. 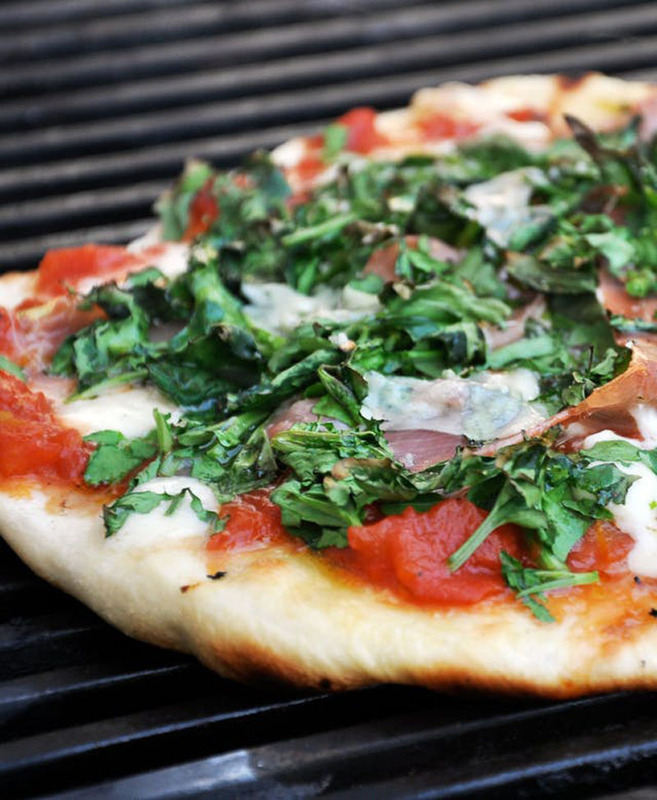 When you grill pizza, you need to have everything ready to go — all the toppings, the sauce, the cheese. This is because the key to pizza on the grill is to top the pizza after you've put it on the grill. It also helps if you cook the dough for a minute or two, flip it, and then top it. Also, I love really thin-crust pizza (think wafer-thin), but I leave my crusts slightly thicker when grilling — the pizza stays nicely chewy with a crisp crust, and it won't fall through the grates. Heat the grill: You should heat it quite hot; my grill was about 600°F with the lid on while baking this particular pizza. Aim for at least 550°F. If you have a choice on your grill between direct and indirect heat, set it up so the pizza is over direct heat. 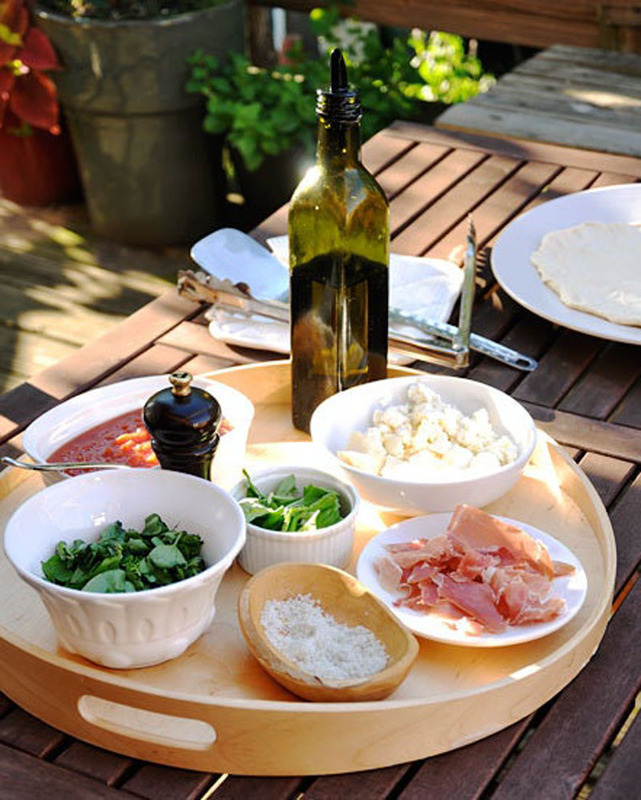 Gather your ingredients and toppings: Set up a table or bench near the grill so you have easy access to everything. Good grilled pizza is as much about the organization and logistics as it is about actual cooking! Brush the dough with olive oil: Brush one side of the dough with oil; this is the side you'll lay down on the grill. Grill one side of the pizza: Take the lid off the grill. Lay the dough round on the grill with the olive-oil side down. Brush the top of the dough with a thin layer of olive oil, too. Let the dough cook for about 3 minutes, with the lid off, or 1 to 2 minutes with the lid on. Use the tongs to lift up the dough from time to time, checking on how it is doing. You want grill marks on it, but you don't want the dough to get crispy; it should be just set. 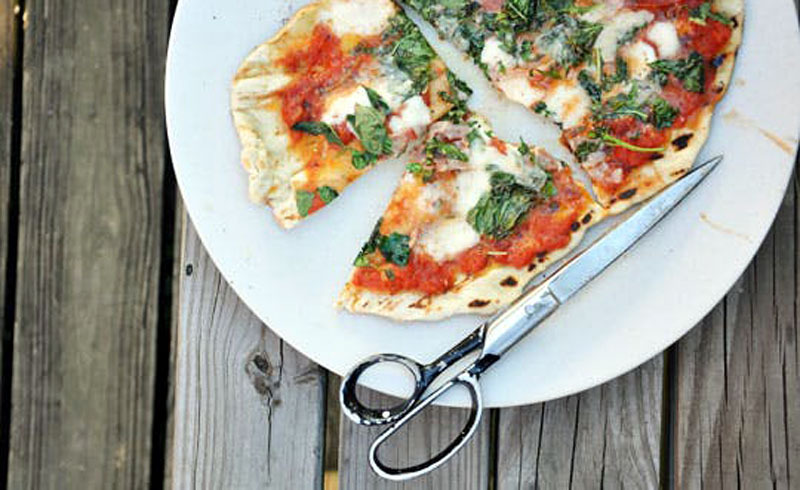 Top the pizza: Flip the dough over with the tongs or spatula. The dough should come up easily and flip without tearing. Now is where your organization comes in! You need to top the pizza quickly. Spread on a thin layer of sauce, some cheese, and toppings. It shouldn't be too heavily loaded, or the pizza won't cook well. Cook the pizza: Put the lid on and cook for 3 to 5 minutes. Use your sense of smell; if the pizza smells like it's scorching, take the lid off and move the pizza to a cooler part of the grill or turn the heat down. Every grill is different! You know your grill and it cooks differently than mine. Your pizza may take longer or shorter depending on how hot the grill gets and where your areas of direct and indirect heat are. 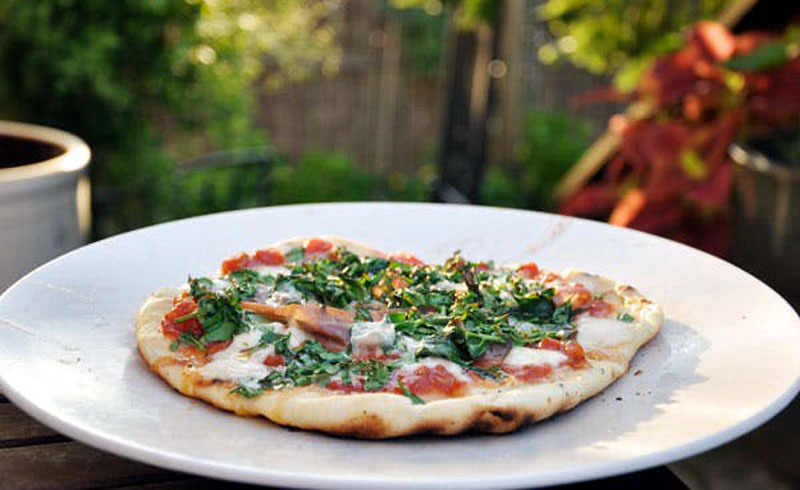 Consider your first pizza a sacrifice to learning just how to control your grill temperature. Cooking times will vary! On that same note, of course, you need to keep an eye on the heat. This method works perfectly every time on my own grill, but the timing depends on how thin you stretch your dough, and how hot your grill gets. Flipping the dough gives you an extra measure of control and certainty, though, that the crust will be cooked through by the time your toppings have melted and warmed.